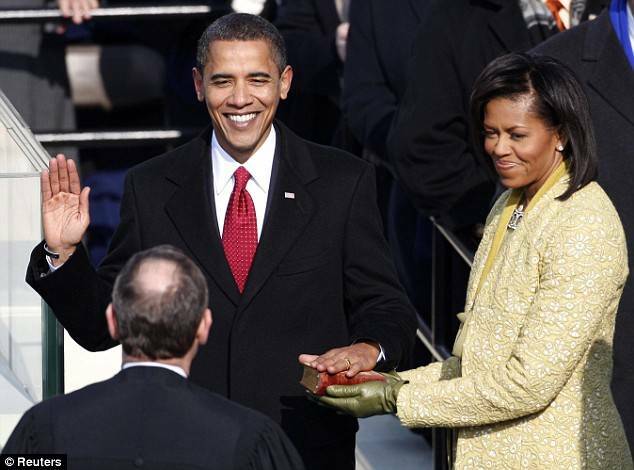 I’m not a strongly political person, but when I saw Barack Hussein Obama taking the oath of office for a second time Monday I couldn’t help but feel absolutely disgusted. The idea of four more years of Obama is absolutely abhorrent to me, and I believe it is dangerous for our country as well. He should clearly be in office for three more years, or maybe five. Four years just isn’t the right amount of time. First of all, this would mean he leaves the oval office in 2017, which feels arbitrary and muddled. 2017? What do we really think is going to be happening in 2017? Much better to leave in 2016, which is just close enough to feel right around the corner. Or 2018, which is just distant enough to feel like the future. But the thought of Barack Obama sitting in the oval office in 2017 makes me sick. Four more years is just wrong. Completely wrong. What can a president do in four years that couldn’t be done in three? Nothing. Absolutely nothing. But what can a president do in five years that couldn’t be done in four? Like I said, I don’t know much about this Obama guy but I’ll bet he could do a lot with that extra year. Four more years of Obama is exactly the opposite of what this country needs. Four more years of left-leaning policies focusing on wealth redistribution and a social safety net? The man will barely have time to execute his vision! He needs five. Or three—bring someone in sooner with fresh ideas. But whatever the case, four more years of Barack Hussein Obama is bad for you, bad for me, bad for America, and bad for the world.